MRP Rs 5,500; Street Price Rs 3700 in Chawri Bazar, New Delhi. I brought this drill kit mainly because my trusty, old Black & Decker drill did not have variable speed capabilities. The turning speed of newer drills can be controlled by varying pressure on the power button; the harder the button is pressed, the faster the drill will turn. Variable speed is crucial for screwdriving operations; it also useful for drilling in ceramic and glass where the initial rotation should be slow. I also have a heavy hammer drill (Bosch GBH-2-26 DFR) that I use for drilling into concrete, really hard masonry or boring holes through walls. The heavy duty drill is also great for drilling into steel and cast iron. The hammer drill is a great machine but it is too bulky for woodworking, particularly screwdriving and making small holes. I needed something smaller, handier and powerful. After reviewing various Bosch machines - and there is no doubt that Bosch makes some of the best power tools out there - I decided to buy the GSB 13 RE kit. Everything recommended that kit. The drill was variable speed, reversible and had a hammer drill capability. It also came in a box packed with DIY accessories, including a small hammer, adjustable spanner, sets of drill bits (masonry, wood and metal), a tape measure, cutter, hex bit holder for screwdriving bits and so on. It looked like great value for money and I could not wait to lay my hands on the kit. When I brought it home, however, I was sorely disappointed. Everything about the kit was cheap and tacky. Even the plastic carrying case is made of much inferior material as compared to other Bosch carrying cases. The drill itself was disappointing; it wobbled on its axis, cut slowly and the switch for drilling type (hammer or regular) moved about on its own. The bits supplied too are of very poor quality. I immediately regretted buying this machine, which I suspect is manufactured cheaply for the Third World market somewhere in China or Taiwan. Initially I had advised against buying this kit no matter how attractive the package might look and cost. This was more than a year ago. Today, as I revisit this post (in July 2012), I must say confess that it is not as bad a package as I had first thought it was. Yes, the make is not the best and the drill has its shortcomings but it is nevertheless a competent machine which I have used without problem for more than a year. For most work, the kit is more than adequate. i had the same problem with my new 2-26DFR...!!! it wobbles on its axis, really seriously dissapointed! im taking it back to the manufacturer! Can you please tell me if you experience the same problem. The wobbling is serious when on 50% speed. the head bobs in and out on its spinning axis. Do you have the same issue ? The Bosch GBH-2-26 DFR that I have seems to be a pretty good machine. I am quite satisfied with it. There is some wobble but it does not seem to cause the bit to drift. As for the bobbing in and out, I believe that is the way it is designed. I may be wrong. You really should take up this issue with a tools expert! the bobbing in and out is a design feature that only occurs in hammer mode. The machine is a good while the freebies are not, since they are not manufactured by Bosch itself. But still, an overall good trade owing the freebie value and the excellent working of the drill... If you are looking for something better try the GSB 16 RE. Wantea a drill and was planning to buy the kit. Bought a Hitachi one instead after reading the review. Mostly use it for drilling 1 to 2 mm holes in PCBs and 1-2 cm holes in aluminum for knobs. Which DIY tool kit do you recommend? I have requirement for drilling holes in walls and for minor furniture repair work. Do you know of any alternative to Bosch? To MD: Black & Decker makes a decent DIY set and there are a few local makes too which will get the job done. Instead of buying a complete DIY kit, I would suggest you buy a good stand alone drill from Bosch, Makita or Hitachi; buy good quality drill bit sets and the screw driver bits separately.You might end up paying a little more but you would have got a good lasting solution. I have bought some great Bosch Titanium drill sets through amazon.com and have been amazed as the difference in cutting quality. Hi. Thanks for the nice blog. I am new to drilling machines and power tools. I have bought this Bosch 13RE DIY kit. But I dont understand which drill bit is for what. 1. Left Half, max diameter 8 (left, half white and rest black) are for drilling into wood. 2. max diameter 10 (middle, steel white) are for drilling into concrete. 3. max diameter 6 (right, black) are for drilling into steel. Regarding different types of drill bits: The white and black bits are for wood, the chrome steel ones in the middle are for plaster and concrete while the black ones are for metals. I purchased this a couple of hours ago for Rs. 4200/-(Rani Gunj, Secunderabad). I bought this for the brand name safety, and the kit box. Bosch website advertised a key-less chuck, and I hoped to find a copy of the same when I went out to purchase. The dealer said that there was no key-less chuck variant available at all for the Bosch GSB 13 RE impact drill. A sort of let down, may be because I couldn't find a better price around and OP has acquired the kit cheaper. I find that OP's main image in this blog post also shows a keyed chuck variant. Apart from that, since I have not yet operated the machine in action, I can say it is take-able if you get it in a good price range. The pieces of the kit sit quite a lot tight in the box, and the user must find a safe way to slide them out of their positions. The machine alone was available at Rs. 3100/-. Maybe, if one wanted the brand name's trust it is a very good buy, for the calculated cost of the kit without the machine surely appears more than Rs. 1100/- if opted to be acquired outside, with the box alone accounting for much of the cost. I definitely will second what OP said: the whole deal could be better. Maybe they sought to sell the starters/DIY-ers/percentage utility/etc a 5.5-6/10 kind of kit, they might have impressed much by selling at least a 7.5/10 kind of kit, and the 6 month warranty doesn't especially separate it from other local makes but for the brand name. I've just bought a Bosch GSB RE- KIT. I am from Ha Noi, Viet Nam. the price is 81 USD. first feeling after use is disapoited.by now i am still feel hurt in my ears and head. The drill is too noisy and quite slow when i try make a hole on the wall. the plastic box look cheap compere with Bosch Brand Name. I am not happy and try to find some review information about this product. It looks everybody have the feeling same with me? 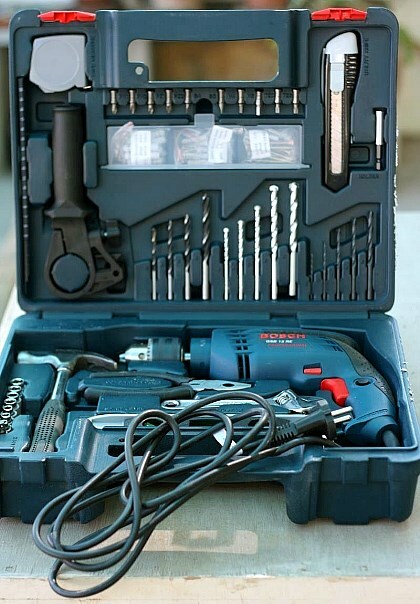 Planning to shift to new flat...after interior in kitchen bedroom,, I have no idea about power tools...drilling m/cs..willing to purchase for household work..like drills in walls ..wood glass steel.help me which Bosch kit I can buy in Bangalore. Col Bala replies: Check this out. http://www.snapdeal.com/product/bosch-gsb-450-re-impact/1408955220?utm_source=earth_feed&utm_campaign=5_93&utm_medium=101256436&vendorCode=S995e6. You can visit the Bosch DIY square at Sarjapur Road, and get some hands on training too. The masonary drill bit supplied with this kit does not drill through tiles. I am not sure if they are carbide tipped and even if they are they just don't work. After reading most of the comments I must say that Bosch can never do this, they are the reputed brand, may be someone supplied duplicate machine? Have every one who complained here, have done the same with Bosch customer acre? Hello. I bought the same kit a few days back. Could you please tell me which bit is used for what. Concrete, metal and wood. Thank you! I bought the same bosch drill kit machine a few days back. can you please tell me where to buy the bits and that wont break for Concrete, metal and wood. Thank you! Hi Indranil,Thanks for this blog.It is really helpful. I bought a GSB RE13 recently. I tried drilling in wall but after an inch depth, it seems like rock and unable to drill.May be pebble or steel,I thought, tried different spots,my hand is painting but can't drill/penetrate anymore. Will there be any improvement ,if I go for separate masonry drill bits online. Can you please suggest/recommend any? You must have hit a beam which is usually made of concrete and steel. Very difficult to drill through this. Best is to choose a different spot to drill. Or else buy a carbide bit and try your luck. Best wishes. Yes it is beam/lintels and concrete roof where I need to drill. I got a carbide drill bit and jumper from a local shop. Tried hammering with jumper followed by drilling some time and again with jumper... and go on...finally able to make holes. It is really tedious job,took most of my day and energy for just 3 holes. Explored more about drilling in concrete beams & my understanding is Sds Max Adaptor hammer drills with better toolbits can do work better than chuck type rotary hammer drill(i.e.,Gsb Re 13/Gsb 600 Re-though it is listed in heavy duty in bosch india website). Thank God...I don't need anymore holes in hard rock concrete i.e., beams but only on walls i.e.,concrete and brick,which can be done with this drill. Now I should focus on woodwork..May be should start with some wall hanging shelf...from the knowledge I got from your blog. You are right about hammer drills being more suited to drilling in concrete. I have a separate heavy duty Bosch drill for masonry work. It really works like a charm. Best of luck with your woodworking.